-Doesn't have much wiggle to his game. Wants to bulldoze his way through opponents. Relies heavily on his strength. Needs to add polish as a ball-handler. Ball slows him down. Wants to pull-up off the bounce at the first glimmer of daylight. -Reluctant passer. Never met a shot he didn't like. Trent had just a decent week of practice and capped it off with an inefficient 9 point on 11 field goal attempt game in USA's win over the World Select team. He measured an inch taller than he did in the past, but other than that, his game hasn't changed all that much since he first burst onto the scene a few years ago. When his jumper is falling, he can be impressive with his shot-making ability, but he'll need to find a way to become more efficient with the rest of his game as he tends to freeze out his teammates. -Very physically mature at 6' 5 and 203 pounds. Strong, proportionate frame. Doesn't shy away from physicality. Solid length with a 6' 8 wingspan. -Impressive scoring instincts - 20.4 points per 40 minutes in seven FIBA U17 World Championship games and 30.3 points per 40 minutes in 49 games in our database. Plays with a score-first mentality that works for and against him. -Most of his offense revolves around his shot making ability. Shot only 26% at the U17s but can get hot in a hurry. Shoots on the hop, not reliant on elevation, 123-for-333 (36.9%) from 3-point range in 49 games in our database. Best as a shooter off the catch but is capable off the bounce when given time and space. Can make a three when the defense goes under a ball screen. -Solid first step. Good footwork attacking closeouts. Can straight line drive due to his size and aggressiveness. Starting to make an effort to play at different speeds out of ball screens. -Not a great finisher overall but has the frame to absorb contact. -Has the size and length to be an adequate defender when he's motivated. Good feet in spurts. Can sit down in a stance. Has the strength to shed screens. -Quick hands and solid instincts in the passing lanes - 3.7 steals per 40 minutes at U17s. -Really struggles around the rim. Doesn't get much lift. Very right-handed. Shot only 5-of-17 at the rim at the U17s. Would benefit from continuing to add more floaters and craft finishes. -Very streaky shooter, especially considering that's likely his most translatable skill from an NBA standpoint. Both elbows flying out, rotation isn't all that tight. Made only 7-of-27 (25.9%) 3-pointers at U17s. Best with his feet set. Can add more ways to get to his jumper off the bounce. -Not a great 1-on-1 shot creator. Limited to mostly straight line drives. Doesn't have much wiggle with the ball. Struggles to cover much ground with his dribble - strides aren't overly long, doesn't take much space laterally with his moves. Has trouble turning the corner, especially when going left as he gallops with the ball. -Can improve his ability to operate as a secondary ball handler. Not all that creative playing out of ball screens. Struggles a bit versus the big defender. -Feel for the game is a work in progress. Not the most willing passer. More focused on getting buckets than making the fundamental play at times. -Can work on becoming more even keel emotionally. Defensive effort declines when things aren't going his way offensively. Likes to complain to referees. Can be a bit too reactive. Trent, who has posted historic scoring numbers at the EYBL level, continued his scoring ways with a solid U17s performance that earned him a 24.3 PER in seven games. The early bloomer excels in international youth play as he's able to lean on his strength and aggressiveness when his jumper isn't falling, which was the case at the U17 World Championships. While Trent is a ready-made scorer who will be an instant contributor at the college level, his NBA upside remains up for debate as he'll really have to adjust to no longer being the most physical guard on the floor and rely more on skill and finesse given his average explosiveness. Trent will benefit from buying into becoming a defensive stopper, transforming from shot-maker to shooter, focusing more on playmaking, and adding more to his game off the dribble in order to maximize his NBA potential. 16-year-old Gary Trent Jr. followed up an impressive FIBA U16 Americas with a solid Nike Global Challenge in which he scored 22 points per 40 minutes pace adjusted on 60% from two and 35% from three. Trent did most of his damage as a spot up shooter, but also knocked down a couple of off the dribble jumpers (mostly uncontested), scored in the post against smaller guards, and filled the lanes as an opportunistic transition scorer. Sporting a very developed frame (193 pounds), Trent was able to absorb contact around the rim despite being an average athlete from a vertical standpoint. He also showed his basketball IQ by diving into the post immediately after switches and punishing smaller guards on a couple of different occasions. While not a great playmaker off the bounce at this stage, Trent does a really nice job playing within the confines of his strengths and scoring in efficient ways  not something you always see out of highly-touted players his age. He moves off the ball effectively and doesn't need the rock to have an impact, which bodes well for his role-playing potential as he continues to develop. With that said, Trent still does have room to improve his ball handling ability and effectiveness as a slasher. He's limited to mostly straight line drives in the half court as he's not all that comfortable changing speeds or directions regularly. The 6' 4 wing also doesn't have great savvy drawing fouls, evident by the fact that he only took four free throws in 129 Global Challenge minutes. Trent has gotten by so far on being bigger and stronger than most players in his age group, so continuing to develop his ball skills, explosiveness and feel as a finisher will be important as the level of size and athleticism continues elevate. Trent can also stand to fine-tune his jump shot a little bit. While he sports very solid mechanics, he has a tendency to be somewhat streaky. Shooting will eventually be his ticket at the next level, so turning himself into a knockdown shooter will be very beneficial for the Minnesota native, something he's more than capable of doing. Defensively, Trent shows sound fundamentals and competitiveness, getting into a stance and using his size to contain penetration against bigger wings. Trent is one of the most polished players in his class and will be a very intriguing prospect as he continues to expand his already fine-tuned skill set. 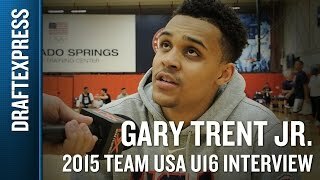 Gary Trent Jr. (NR Scout, NR ESPN, #45 Rivals, #5 24/7) got his first invite to USA Basketball, and thus we got a first look at his physical dimensions. He's got decent size for a shooting guard at 6-5 in shoes, to go along with a nice 6-9 wingspan. His frame is fairly developed for a player his age at 195 pounds, as is his overall game. He's a fundamentally sound and well coached player with a high basketball IQ, who makes the extra pass, competes hard on both ends of the floor, and knows his role. Trent's best attribute is his outside shot, which was very consistent throughout the week thanks to his picture perfect mechanics. He's outstanding with his feet set, and is capable of pulling up off the dribble smoothly as well. That's a good thing, since his ball-handling ability is very underdeveloped relative to his outside shot at the moment, but makes him somewhat one-dimensional as a shot-creator. He is able to punish weaker defenders in the low post with his back to the basket, showing excellent footwork in the process. Trent is a very mature and polished 16-year old, but will need to continue to add more parts to his game as his peers catch up physically and mentally to stay ahead of the pack.